There are a number of ways to transmit power between two shafts, often to enable speed reduction and torque increase, but one of the easiest ways is to use a form of belt drive. They come in a number of different forms with pro’s and con’s for each dependent on the application. Flat belts running on smooth wheels, not used so much now, but they can offer really high efficiency. 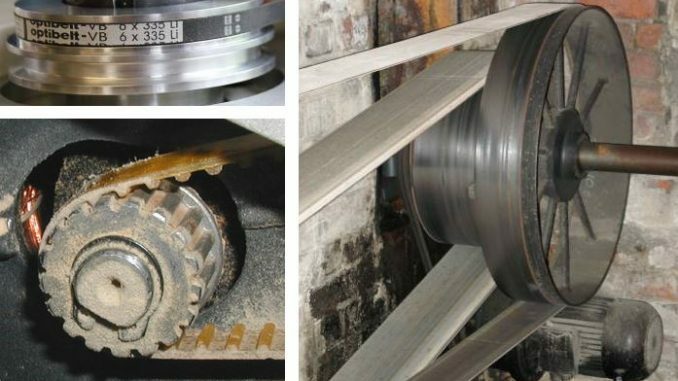 Toothed (or Synchronous) belts are always more efficient than V-belt drives, but four considerations preclude them from many applications. They make a whirring sound that can be objectionable in some applications – see notes below for the different noise mechanisms. Unable to slip when driving loads that are susceptible to jamming. They are more sensitive to misalignment, which can cause them to wear unevenly or fail prematurely. This can be a problem where the drive motor or load is on a flexible mount as this can result in misalignment under certain load conditions. Under extreme conditions the flexibility can lead to the belt jumping. Impact Noise – produced from the impact between timing belt and pulley. The resultant displacement of the belt will propagate away from the impact point. The impact will result in the pulley vibrating and hence radiating noise. 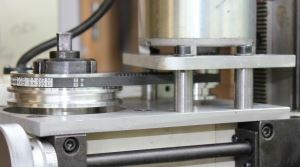 The design of the pulley should be such that the first mode of vibration is greater than the impact frequency over the operating speed range of the pulley. The impact frequency can be calculated from the rotational speed of the pulley and the number of teeth on the pulley. Belt Vibration – this can be transverse and torsional belt vibration (goose noise or whine). Air Pumping – flow of air between the belt and pulley. The air will be squeezed out when the belt teeth engage the pulley and air will rush in when the belt disengages from the pulley. Friction – the friction between the pulley and timing belt can result in a local noise production or the force imparted into the belt that then radiates noise. Pulley Torsional Vibration – this can be due to a fluctuating torque created by whip in the belt or by a non-uniform tooth spacing that results in a rotational input into the pulley. If the belt is whipping then it might need an idler pulley to support it and/or apply damping to the belt. Pulley diameter affects V-belt efficiency, with larger pulleys producing greater efficiency. Narrower or fewer V-belts produce greater efficiency at low torque, while wider or more belts offer higher efficiency at high torque. Underbelted or overbelted V-belt drives are inefficient. Large variations exist between V-belt drive efficiencies (eg a notched belt). V-belt drives may be efficient at the time of installation (achieving 95 to 98% efficiency), but they soon stretch, causing their tension to drop. V-belt drives need proper retensioning or efficiency may deteriorate as much as 5% due to belt slippage. The multiple cone pulleys on the drive system for the Warco WM24oB allow a number of spindle speeds to be created from a motor that runs at a single speed. Note the tensioner that does two jobs: 1. allows the belt to be tensioned when the drive pulley locations are fundamentally fixed and 2. pulls the belt such that it wraps further around the pulley and so giving a larger contact area between belt and pulleys. 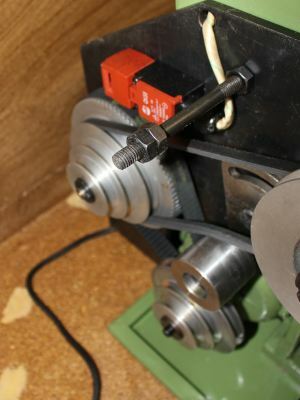 Mini-Mill Belt Conversion – I made this conversion from gear to belt drive for the Mini Mill and it transformed the mill from a very noisey machine that was difficult to use due to the noise levels and the impact that the gear meshing imparts on the milling bits.